The evidence: still not good enough to satisfy the birthers? Some of us are born to be accountants and actuaries; these sober folks keep the world’s vast machinery humming smoothly (if prosaically) from one day to the next. Others among us still commune with the powers and principalities of the air; from these fertile, feverish minds spring all manner of inventions, art, philosophies, religions, myths, follies and (of course) blogs. There’s a place in this humdrum world for the otherworldly types. I respect the childlike souls who believe in fairies, ghosts, banshees, wood nymphs, elves and sprites, not only because such beliefs are colorful but because nobody has ever succeeded in disproving them. I have less respect for those who persist in believing that President Barack Obama was born outside the United States. Why? Because the “birthers” refuse to renounce their eccentric faith even when confronted with stark, tangible evidence to the contrary. They’ve latched onto an idea like a terrier sinking its teeth into the mailman’s pants, and they just won’t let go. Last night on CNN, during a testy debate with Donald Trump, stalwart reporter Anderson Cooper displayed a photograph of Obama’s birth certificate. Everything about it seemed kosher: the parents, the date, the place of birth (Honolulu). Did The Donald accept the evidence and call a halt to his overhyped birther crusade? No way. He merely expressed his “sincere” hope that Obama was a native Hawaiian while he continued to deny the validity of the evidence. In the gospel according to Trump, the certificate on display was a short version of the genuine article, which is kept sealed in some secret Hawaiian vault. That much is true. Told that the short version is actually the definitive birth certificate that Hawaiians use to prove their status, Trump refused to back down. No matter that the governor of Hawaii has stated that he knew Obama’s parents while they were expecting our president. No matter that other witnesses, including a Hawaiian obstetric nurse, have stepped forward to verify Obama’s Honolulu delivery. No amount of evidence will convince these people. After all, the “Certification of Live Birth” could be a forgery, couldn’t it? Or it could have been tampered with. The birthers believe that Obama is a foreigner because they want Obama to be a foreigner. If Obama is a foreigner, his presidency is automatically invalidated. And the birthers would do anything in their power to invalidate Obama. But the birthers’ fevered faith runs even deeper than a desire to unseat an intelligent African American president with an Islamic middle name. It’s the same faith that insists on planting a second gunman on that grassy knoll in Dallas, the same faith that claims our government is hiding the remains of aliens who crash-landed in the New Mexico desert. I can sympathize with the conspiracy-mongering mentality up to a point. Is vital information is being withheld from us commoners by the people in power? You bet it is. Look at the nefarious schemes perpetrated behind closed doors by lobbyists, Congressmen, Wall Street honchos and our own Department of Defense. That’s where the birthers and their ilk should be pointing their magnifying glasses… not at Hawaii’s record keepers. I don’t think so. Add the photographed birth certificate and all the other corroborating evidence, and it becomes virtually incontestible that Barack Obama, Jr., is a bona fide native of the 50th state. Case closed, at least in the opinion of The New Moderate. Here’s an unsettling statistic for you. During Obama’s rookie year as president, some 58 percent of Republicans reportedly believed him to be foreign-born. Two years later, that figure is still hovering around 47 percent. Optimists might point to the marginal progress toward rationality, but it makes me a little queasy that nearly half the Republicans in this country are birthers. When I think about those same 47 percent having a voice in selecting the next Republican presidential nominee, I feel even queasier. Personally I do not care whether Barack Obama was born in Hawaii, or Keyna. Whether he is or was ever a Muslim. We are past the point where place of birth should be a factor in ones eligibility to be president or anything else – but that is still a constitutional requirement. Religion never has been a legal qualifier, even if many past candidates lost elections solely based on their religious affiliation. Beyond that whatever the circumstances of Barack Obama’s birth and childhood – he was not engaged in some plot as an infant to nefariously and falsely qualify himself for the presidency. There are alot of reasons I would not vote for Trump as President – though given that my choices were Donald Trump and Obama, I would be forced to picked Trump. I also suspect that Trump is not looking to become president. That he knows he has sufficient profile and sufficient credibility to raise issues like this which whether you recognise it or not do have an impact and do have some merit. This mess started roughly speaking with Lawsuits by Phillip Berg against both McCain and Obama challenging their eligibility to be president. The suits were dismissed for lack of standing – though I would question who then actually has standing to determine whether a constitutional requirement is being met ? McCain chose to provide all information regarding his birth and in his instance the issue disappeared. Obama has either done nothing or arguably impeded resolving this issue, and as a consequence of that the issue not only will not die, but an increasing number of people believe that he was not born in Hawaii. The Certificate of Live Birth issue has already been beaten to death across the web. Whether the birther arguments regarding the COLB have any merit or not, releasing the actual birth certificate (and there are a very small number of instances were the COLB or equivalents are not legally acceptable – because they are insufficient as proof for some things) may not satisfy everyone, but it certainly would reduce the noise on this issue by an order of magnitude. Barack Obama promised openness and transparency. He promised an end to many policies of his predecessor. He has repeatedly reneged on both. The far left in particular has good reason not to trust him. Trust is something you earn. What the birther phenomena demonstrates is that Pres. Obama’s credibility is only slightly higher than theirs. We are not talking about 2nd gunmen on the grassy knoll, or UFO’s hidden at Roswell. We are not talking about disproving a negative. We are dealing with an issue that can be settled – maybe not to everyone’s satisfaction, but to the satisfaction of the overwhelming majority of us. The rules of each state are somewhat different, but they generally all have some form of birth certificate that they can produce on demand. The COLB is hawaii’s equivalent. They are acceptable as proof of many things – including identity and citizenship. But they are not necessarily proof of place of birth. My children are both adopted, they were both born outside the United States, They are both US citizens and both have birth certificates issued by the county court where I live. Neither is legally qualified to be president unless the constitution is changed. At the same time I actually believe that Barack Obama was probably born in Hawaii. I also believe that there is something about his actual birth certificate that he does not want made public – or he would have ended this mess and released it long ago. Ordinarily people are entitled to their privacy. If Barack Obama the local garbage collector was being publicly pilloried because he was unwilling to produce his original birth certificate, I would be telling everyone to go to hell. He is entitled to his privacy. But Barack Obama chose to enter public life, he chose to run for public office, he chose to run for president. He understood full well that like it or not one of the sacrifices required was personal privacy. He is still allowed to claim privacy over certain portions of his life, but unlike the garbage collector, I do not hold any sympathy for him when an easily resolvable issue such as this one will not go away. As to false beliefs our schools still teach that the great depression was caused by trading stocks on the margins, that Pres. Hoover sat on his hands and did nothing, and that FDR (or World War II) saved the nation. Each of these is demonstrably false, yet most Americans are taught them and believe them with out question. Compared to that what is confusion over a birth certificate ? In President Obama’s “rookie year” the deficit increased by fully one Trillion Dollars. The increase in the national debt for a single years was as great is that of either of Pres. Bush’s terms. We wasted almost a Trillion Dollars on Keynesian stimulus that we have fully known does not work since the seventies. Congress passed and the president signed several huge new bills that no one could honestly claim to have any idea what they contained. If as a result of this mess the President is forced to prove incontrovertibly that he is not an illegal alien or a green man from mars, then I have little sympathy for him. 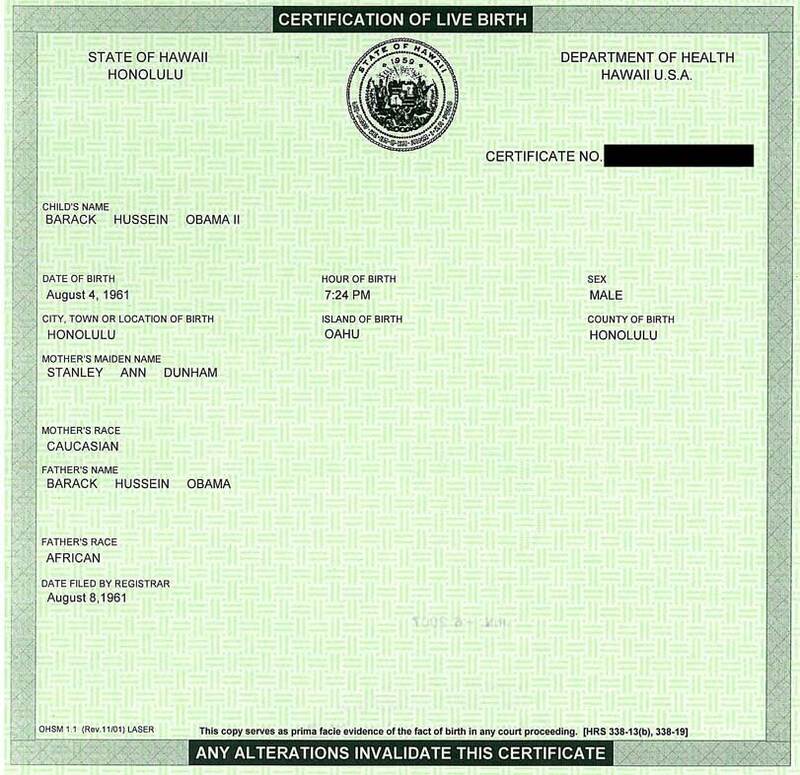 The birthers’ rejection of Hawaii’s “Certification of Live Birth” seems forced and contrived. They know that Hawaii doesn’t release the original certficate; it’s stored in the state archives. The much-reproduced shorter version is essentially an abstract of the longer document. I think it’s extremely unlikely that the essential facts would change from one document to the other. That said, Obama has been unusually secretive about various aspects of his life. If the birthers want to invalidate his presidency, as they seem driven to do, they might focus on his boyhood in Indonesia. His biographical profile tells us that he went first to a public school there and later to a Catholic one, but who knows? Apparently his Muslim stepfather wasn’t a religious man, and his mom was a flower-child humanist without conventional religious beliefs. But I don’t doubt that he might have set foot in an Indonesian mosque now and then. Obama has also been secretive about his school records. I didn’t want to muddy my post with Trump’s speculations about Obama’s academic bona fides, though it’s probably a given that he benefited from affirmative action. Still, he’s obviously a very bright man, and you don’t get to be editor of the Harvard Law Review if you’re an intellectual slouch. Obama’s various missteps in office are another issue, and they’re not really germane to this post. He’s still a baffling figure in so many ways: a career progressive who’s a little too cozy with big-money interests. I characterize him as a member in good standing of the liberal elite, which would explain some of his paradoxical behavior. The fact is that we know very little about the character and background of the man that is in the White House, and that is not good. He has not only refused to allow his birth certificate to be seen, he has sealed his elementary school records, Occidental College records, Columbia University records, Columbia thesis, Harvard Law School records, Harvard Law Review articles (if there are any), scholarly articles from the University of Chicago (if there are any), his passport, all of his medical records, all files from his 8 years as an Illinois state senator (claims they were “lost”) , his Illinois State Bar Association records, baptism records and his adoption records. Now, I agree that the actual “birther” stuff – that is, the idea that Obama was not born in Hawaii – is probably nonsense, but I think that Obama and his people have chosen to focus condescendingly on that narrow issue, in order to mock those who very legitimately ask if Obama was “sold” to the American public as a very different man that the one he actually is. When anyone hides as much about his past as Obama does, it is natural for people to wonder what exactly it is that he is hiding and why. It’s not that Obama doesn’t have a right to certain privacy, but Americans have the right to know the character of the man who is their commander-in-chief, who can lead the nation into war, who sets the tone of our national agenda from his “bully pulpit” and who represents the face of America to the world. It’s as if any questions about Obama are off-limits – criticism of him is met with charges of racism and questions about his past are met with charges of birtherism. This past Sunday, Obama broke with presidential tradition and did not issue an Easter greeting to American Christians, after pointedly issuing greetings on every major Muslim holiday this year. When asked about this, his press secretary scoffed, as if this was just crazy talk by nutcases. But…..seriously, the President of the USA couldn’t just say”Happy Easter” to the largest single religious group in the country on their most holy day?? He had to have known that this action would be controversial and offensive to many, so why do it? Priscilla: I see you’ve noticed Obama’s penchant for secrecy, too. I didn’t know all the specific areas of obfuscation, so thanks for listing them here. As for his Easter snub… I agree that it was a peculiar oversight — and foolish, too, given his fragile relations with America’s Christian community. Yes, he goes out of his way to be a multicultural president and ignores the country’s biggest religious group. Was it a deliberate snub? I doubt it. Even if you see him as a crassly expedient politico, he certainly wouldn’t want to antagonize such a huge voting bloc. He probably thought it was sufficient to hold that Easter breakfast, where he actually mentioned Jesus. I guess he was wrong. LOL. Sure, Priscilla, I’ll take the credit… otherwise I’d have to give it to Trump. I wonder how the birthers will regroup: maybe we’ll start hearing about “schoolers”: those who believe that Obama used fake academic credentials to get into Columbia. He should have just done that long ago, on the other hand it may have been effective politics; true moderates, the kind who swing elections, have seen the completely wacked side of republicans for several years now and its not a pretty sight, which can only help Obama. As to some of the economic theories I read here and everywhere, well, there are many areas in which the truth in economics is completely subjective and the arguments can go on forever and no one can prove that they are right or wrong. However there are other areas where it is possible to be completely off track and talk nonsense. Sorry to say it but most of what I hear about economics online is the latter. To be able to make truly solid economic pronouncements on the grand scale is like being able to formulate a plausible unified field theory; the people who have the intelligence, education and experience to do so number no more than in the thousands. I took quite a few economics classes from world class teachers in college and really enjoyed it and did very well. I am not nearly qualified to make the pronouncements of the type I read online in forums, but I am fit to recognize rubbish and I see a LOT of it. Following the recent economic failures, followed by the long-term crisis, even W. Bush’s top economics advisors understood that with out immediate and drastic action, complete calamity was a real possibility. The causes that led to the situation were NOT simple and did not occur do to one action, one deregulation, one president, one policy. It was an extraordinarily complex perfect storm that was brewing for 30 years at least going back to Reagan’s deregulations and followed by Clinton’s. The perfect storm did not have to happen, but massive incompetence in many many areas, people who thought of only their tiny part of the picture and not the whole picture brought it on. In short Obama inherited a god awful mess that is going to take many years to escape from. Personally I am convinced that the stimulus was the best option as a generality, you can argue about specific parts. But Americans are so economically illiterate that he will get the blame if a miracle does not occur adn he will hear total nonsense from the likes of the Wall Street Journal as he tries to cope with the mess. I am very very thankful that we did not spend this period under a republican administration, Republican economics or Conservative economics or supply side economics or give the rich a tremendous tax break to cut the deficit economics is real complete Hooey. Republicans still are mad that a black US had chosen a black President, and moreover *with a Muslim middle name*, gosh darnit! I am just glad this “birther” thing is over. Two years and counting. Now why is he not releasing his school records? Why is he proclaiming “transparency” in the beginning of running for President and then not providing open information since that time? Why did the White House not release the “visitors list” of the first “hundreds” of “personal” visitors to the White House when he took office? He is apparently “enjoying” his stay in office without a personal agenda to do something major for the country. It is apparent that he is letting others (with an agenda based on an Ideology) “run the country” (czars). He only expresses deep action when someone steps on his “toes”. Just like the “accidental” firing of “sherrod” or when the media catches information on “van Jones” and his Communist history and his current Marxist – Green, and hateful speeches toward Republicans (politician and citizens). He has given many positions of power to groups and individuals that have helped him become Prez. And rightfully so as any person would do. You have to trust who follows your Ideologue. It just shows that who you are is determined by the association you carry. There is more to the Prez. than one can imagine. I just “hope” that the citizens of the U.S. will not suffer too much for the Ideology that the Prez. is pushing. What I find ironic is that the Prez. has not mentioned what Ideology he stands clearly for since he ran for office. Yet, his two books mention many accounts of association to making life “fair” (in his way) and his associations with Muslims and people in Marxist/Communist Ideology. Trumps New Obama conspiracy theory. I’m not sure how many actual moderates are posting on the New Moderate though. Was Obama a good boy when he was in kindergarten? I want to see what his educators wrote about him! I want transparency! A preschool boy with a Muslim name should not be President if his educators say that he was a bad boy! I bet Obma burned his bad records after he graduated the kindergarten… What am I saying? I he did not even graduated from kindergarten, that stupid was that black boy. A normal US President should have his University diploma bought by his rich parents and as President should chock on a pretzel, why did not Obama chocked on a pretzel yet? Thanks Priscilla for the link. I just read exactly what I thought it was common sense in regard to why somebody born outside the US is not eligible to be US President. The requirement stipulated in the Constitution was intended to prevent the accession of presidents with divided national loyalties. Obama, even born in Kenya and even living there for his firsts months could not be loyal to Kenyans. Republicans are actually afraid that Obama may be loyal to Muslim religion, but then so what? America has the freedom of all religions… at least that was last time I checked. It seems also that Republicans put more weight on what it seems that Obama grandmother says that Obama was born in Kenya, but his father name is the same! Moreover, Republicans are now digging in Obama Sr. past for being a “slippery character” as Harvard University student. So, let’s deport President Obama because his father was a “slippery character” … YAY! Forget about the US economy let’s have entertainment! It seems that Obama Senior was born in Kenya… BUT… he was British citizen… Here is the truth: BRITISH WANT TO TAKE BACK OUR BELOVED UNITED STATES OF AMERICA! Valdo: There’s an old political activist named Lyndon LaRouche — a brilliant guy but a bona fide wacko — who insists that the British Empire is the root of all evil in the world, even today. So maybe Obama’s father was “planted” in Hawaii by the Brits to sire a son who would be groomed for the presidency by the world’s British-backed banking interests. It gets more intriguing all the time, doesn’t it? Oh, and today I received an e-mail from some “colonel” in Arizona who’s certain that even the official birth certificate Obama revealed yesterday has been doctored. If you view it as a PDF, you apparently see superimposed “layers” of more recent writing. It never ends. Rick wrote: It gets more intriguing all the time, doesn’t it?